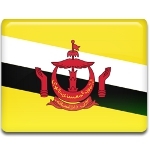 National Day in Brunei annually falls on February 1. This holiday celebrates gaining independence from the United Kingdom in 1984, that actually happened on January 1. The Europeans appeared on the territory of modern Brunei in the 16th century. Great Britain intervened in the affairs of the country for several times, that resulted in singing of the Treaty of Protection in 1888. According to the treaty, Brunei was under protection of the British and the sultan of Brunei couldn't cede or lease any territory to foreign powers without British consent. Although Brunei faced the toughest period on the early years of its development, the process of decolonization lasted till the beginning of the 1980s. In 1983 the United Kingdom announced, that Brunei would become totally independent on January 1, 1984. The Proclamation of Independence was read by His Majesty Hassanal Bolkiah at midnight on January 1. Nevertheless January 1 is an official date when Brunei became an independent country, National Day is traditionally celebrated on February 23.